Stained glass is predominantly a Western art form. When we think of stained glass, we think of Gothic cathedrals, right? Stained glass is believed to have originated from Byzantine (ca. 500 –1453) mosaics that used glass tesserae (squares of cut glass) in multiple colors. Stained glass began to adorn Western churches during the Medieval period (ca. 500–1300). The earliest examples remaining date from between 1000 and 1050. Stained glass was a significant art form from that period through most of the 16th century, primarily in Western religious structures. In Western art history books, stained glass disappears in writing until the mid- to late-nineteenth century. A renaissance in the art form began at that time. 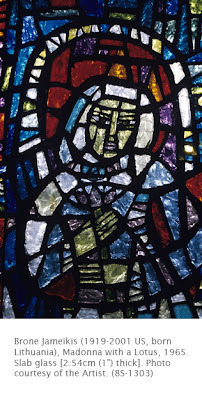 Brone Jameikis was a major force in stained glass art. Two stylistic movements led to the rejuvenation of stained glass as a major art form in the West: Gothic Revival (flourished ca. 1830s–1860s), a style born out of the Romantic movement in which any past style was fair game for imitation (the style was mostly in architecture and furniture); and the Arts and Crafts Movement (flourished 1860s to early 20th century), which was a conscious revival of past styles, particularly Medieval, with an emphasis on the quality of hand-crafted decorative arts as a reaction to mass-produced objects of the Industrial Revolution. Stained glass was a major factor in both movements, and, in the late nineteenth century, became increasingly a medium taken up by women. In both the nineteenth and twentieth century, painters often began working in stained glass (including John La Farge), but the period saw the rise of artists dedicated to glass (such as Louis Comfort Tiffany). Into the 21st century, artists dedicated to stained glass abound. Jameikis is an artist whose body of work was primarily stained glass. Jameikis was born in Vilnius, Lithuania. Her earliest memories of stained glass were of being fascinated with the windows of a Gothic church in Vilnius and the colors produced by the light going through them. That became a life-long fascination in her work. Jameikis worked primarily in slab glass, one inch thick pieces held together by epoxy resin rather than lead. While her works reflect an understanding of the structure of traditional stained glass, they also recall the fragmentation of form of modernist movements such as Cubism. This window is an image of the Virgin Mary holding a lotus. The lotus was an ages old symbol of purity and spontaneous generation, both reflecting Mary’s position of divine birth in Christian doctrine. The thickness of the glass gives the piece a more luminous and glittering appearance than traditional stained glass because of the refractive qualities of slab glass. 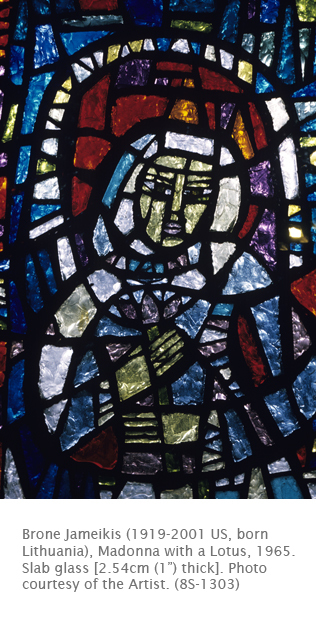 One of Jameikis’ most enduring monuments in stained glass is her work for the church of Saint Peter in Honolulu. Activity: A faux stained glass panel. Materials: wax paper, crayons, black construction paper, glue, a hot iron. Have students design a relatively simple stained glass window, possibly abstract. Students shave various colors of crayons onto the wax paper (placed over a study drawing) following the shapes in the drawing, and cover the shavings with another piece of wax paper. Applying the hot iron to this will fuse the shavings together. Black construction paper can be then cut out to frame the various areas of color. Where is this work by Jameikis exhibited today?